The box contains parts for 44 spear armed Thegns although there are some extra sword and hand-axe arms too. 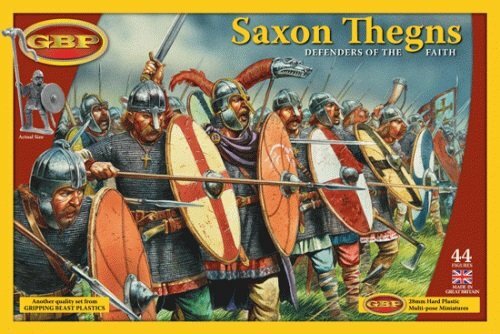 The set also includes extra parts to convert up to two of your warriors into Saxon Lords and up to two into horn blowers. The set also includes two dracos and the instructions include 2 full-colour paper banners to attach to spear-armed warriors. Included in the box is a sprue of plastic bases to mount all 44 of your figures.